Multi-touch technology – which lets you use more than one finger to tap a screen, drag items around, and do other tasks without a mouse – reigns supreme on smartphones like the iPhone and media players like the Zune HD and iPod Touch. But the reception for multi-touch technology on a PC has been anything but touching. To date, users have shown mainstream resistance to finger tapping a computer screen. In 2008, touch-enabled units accounted for only about 1 percent of the notebook market, or approximately 1.4 million PCs, according to research company IDC. Why the low numbers? The long habit of using a mouse is one culprit, as is the fact that the user interface of a PC, with its small icons and buttons, is not finger-friendly for everyone. What’s more, extending your arm to an eye-level screen a foot away can be awkward and uncomfortable. Despite lackluster user response to touch, Apple baked multi-touch capabilities into its Mac OS X Leopard two years ago, and now Microsoft has done it with Windows 7 – with the hope that the new OS will start a PC touch movement. PC vendors have jumped on board. Big-names such as Dell and HP already offer multi-touch on their “all-in-one” computers and Lenovo, Acer and Sony have announced plans to release touch-screen PCs running Windows 7. 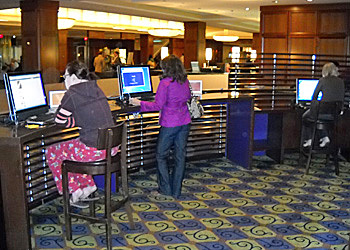 One of the earliest adopters of Windows 7 touch-screen machines is Sheraton Hotels, which three weeks ago installed HP TouchSmart computers running Windows 7 in its Link@Sheraton workstations. 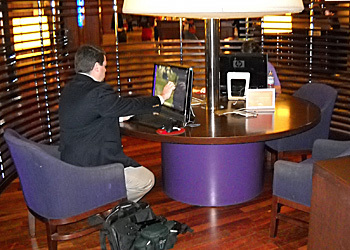 These recreational spaces are in most Sheraton lobbies and contain comfortable chairs, tables and computers. Selected Link@Sheraton spaces in major cities now have the 22-inch HP TouchSmart machines for guests and lobby dwellers to use. According to Mark McBeth, VP of IT at Starwood Hotels Inc. – which manages Sheraton and Westin hotels, among others – the company currently has 40 HP TouchSmart machines deployed at seven hotels in major cities such as New York, Boston, San Francisco and Chicago. Starwood crafted a deal with Microsoft and Hewlett-Packard wherein the Sheratons will have the HP TouchSmart machines free for one year, says McBeth. “The Link spaces are a vibrant part of the Sheraton lobbies where people are spending lot of time, so we want them to be clean and uncluttered with all-in-one computers because those machines have so few cables or power cords. And we wanted current technology like Windows 7,” McBeth says. But there’s another reason that McBeth pursued Windows 7: he wanted his team and IT managers across Starwood’s hotels to be exposed to the new OS as preparation for an eventual company-wide deployment, he says. Starwood, primarily a Windows XP shop now, has an enterprise agreement with Microsoft and was able to test Windows 7 RC and RTM versions, says McBeth. Additionally, Starwood currently has about 150 workstations running Windows 7 in the company’s accounting and sales offices, he says. “We’re interested in Windows 7 and we’re going to let our deployements grow organically,” he says. So what has been the man on the street reaction to Windows 7 multi-touch technology? John Reid, IT Manager at the Sheraton Boston Hotel, says that the Link@Sheraton areas in the lobby are busy almost all the time – but not necessarily because of Windows 7 or touch technology. 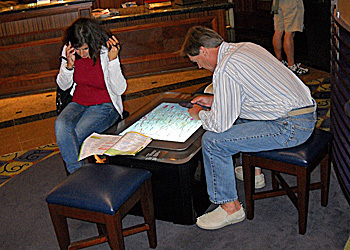 The Sheraton lobby also contains a Microsoft Surface unit, a $10,000 multi-touch table computer that allows users to manipulate digital content with hand gestures. The Surface computer has been in the Boston Sheraton for about six months and is constantly in use for everything from playing music, to searching for restaurants, looking at maps for directions, and playing checkers, says Reid. Reid thinks that the PC touch-screen use will pick up as more people use the Microsoft Surface table. On a weekday morning last week at the Sheraton Boston, nearly every HP TouchSmart machine and the Surface Table computer were being used. But it was difficult to find a lobby dweller using the touch-screen feature on the PCs. One guest, who preferred not to be named, revealed himself as a touchscreen fan and was skillfully using his fingers to pinch and expand a map using Microsoft Bing Maps on one of the HP TouchSmart machines. When asked if he prefers touch over a mouse, he said he still likes the mouse, but mostly out of habit.